That was the biggest takeaway from Head Coach Mike Zimmer’s press conference after the Vikings 17-16 win over the Bengals in Cincinnati. The offense showed flashes of what we saw at training camp and some that make fans immediate look back at some of the 2015 struggles. Defensively, the Vikings were fairly solid with thier starters. They played a very vanilla-type scheme in terms of pressures and even in the back half but did not surrender any points in the roughly 10 snaps the starting unit had as a whole. Rookies flashed in a multitude of ways on both sides of the ball, again proving for the time being that Rick Spielman and co. had another fine draft. After having the ability to go back and rewatch the game, there were five big takeaways that were both bright spots and areas that the team will surely focus on in the short week leading up to the Seattle matchup. Below are my five takeaways from the preseason opener. The starting offensive line struggled mightily throughout the snaps they took. John Sullivan was called for a chop block, something that is a point of emphasis for officials this year. Alex Boone and Joe Berger were the two bright spots on the line for the starters. Andre Smith was iffy in pass protection, often leaning too much forward and practically allowed Michael Johnson a free pass to Bridgewater on a sack. Brandon Fusco was held out due to injury and it’s still uncertain when he’ll return. The second and third team lines didn’t struggle as much although struggled to generate a push in the run game. For being a just in his third year, Teddy Bridgewater is one of the most scrutinized quarterbacks in the NFL. People knock his arm strength, his accuracy, his pocket presence… the list could go on. One thing we saw from Teddy last night was his decision making. despite getting pummeled in a preseason snaps, he showed the ability to hit the checkdown but not force the ball into a tight window. 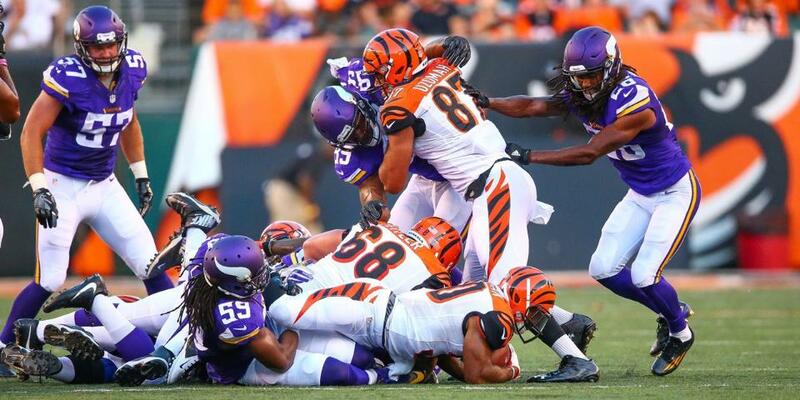 Arguably the best part snap from Teddy “Two Gloves” last night was his stiff arm on defensive tackle Geno Atkins. The arm strength questions will now be put to rest for the time being after connecting with Charles Johnson on a deep strike of 49 yards. Offensive coordinator Norv Turner stuck to his guns and continued his two tight end-multiple formation sets, something that I wrote about previously at training camp. In the run game, we saw a lot of inside zone and wham/gut leads. There was a lot of wing formations in which the wingback (Pruitt when starters were in) would have a spliceback-type route, trying to fool the eyes of the opposing linebackers. As I mentioned in that previous piece, we also continued to see the vertical passing game. There were more intermediate digs and post, creating one on one situations. We didn’t see a ton of full house situations but that largely could be due to the personnel that was inactive. As what will be music to some Vikings fans’ears, second year cornerback Trae Waynes continued to build off his impressive camp with a good showing last night. Primarily playing most of the first half, Waynes wasn’t as handsy-something that he struggled with a lot last season. He showed good body position when playing the ball in the air, and a comfort level that was missing as a rookie. The thing that I like the most, was his willingness to fly in to play the run. I was impressed by Waynes throughout camp and last night assured me that he should easily be the starter. To start it off, David Morgan II is going to be a major contributor in every facet of the offense this season. He was great in the running game, opening up lanes on the play side and even washing his assignment down the line to create cutback lanes. As a receiver, he displayed soft hands a sneaky route running. Laquon Treadwell had a few good snaps, showing the ability to catch outside of his frame and a good understanding of finding a soft zone. He also showed good hands with his initial release. I felt like both Kentrell Brothers and Jayron Kearse had a handful of snaps that will build thier confidence. However, they also showed snaps of being timid when attacking. As a bonus, CJ Ham and Tre Roberson both excelled in my opinion. If they can continue to build off thier respective camp performances and string it into thier preseason snaps, it will be difficult to cut them. Minnesota will face the Seahawks Thursday night in Seattle.